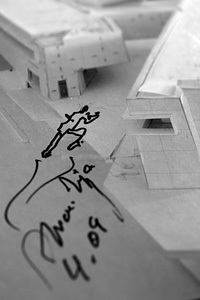 In the spring of 2009, at an architectural conference in Zagreb, Alvaro Siza was the last speaker. At the end of the lecture, Marcel Ferencz, who is the architect of the exhibition constructed in the Hungarian Pavilion, joined the queue forming up to collect autographs. Although winding queues of this kind for famous architects have slowly become commonplace, the formalities of the architectural star system carry many a nervous moment along with them. For example, a moment when somebody comes face to face with the person whom up to that point they had only known through their work and photographs. After a few minutes, when it became Marcel’s turn to collect Alvaro Size’s autograph, he handed the monograph over saying: A big graphic please! In the tenseness of the situation he had jumbled up his words and condensed autograph, biography and monograph. Siza looked at Marcel. He smiled and then answered: “I can see that you seriously go in for sports…do you know what? I’ll draw an athlete here just as he’s running into a sports centre.” Smiling all the while, he took the felt-tip pen handed to him and then with a few strokes sketched a sprinting figure onto the sheet. As he was sketching, the air around Alvaro Siza froze. The people in the queue became silent and others standing around watched without a word as he drew. An architect allowing others to catch a glimpse of how he worked in his office had an elemental effect. The baited breath of the people waiting for an autograph was as much directed at Siza as the phenomenon; he respected the man just as much as what he was doing. That little drawing exerted a magical power primarily because it was created in the midst of a crowd that had up to then being milling around and were now frozen with anticipation. It not only became clear that architects still draw. What was also so manifest was that how they draw is interesting. The greatest inspiration of this architectural exhibition organised in the Hungarian Pavilion in 2010 was this story and the lessons that it provided.